Walter Zinn (1906-2000) was a Canadian-American nuclear physicist. Zinn was born in Kitchener, Ontario, in 1906 and graduated from Queens University in 1927. He received his M.A. from Queens University in 1930 and went on to receive his Ph.D. from Columbia in 1934. During World War II, Zinn joined the Manhattan Project at the Metallurgical Laboratory at the University of Chicago. He worked closely with Enrico Fermi in initiating the world’s first self-sustained, controlled nuclear reaction, Chicago Pile-1, on December 2, 1942. After the war, Zinn served as the director of the Argonne National Laboratory. He supervised the construction of several new nuclear reactors, including the Experimental Breeder Reactor I (EBR-I) in Idaho. After leaving Argonne, Zinn moved to Florida and started a consulting firm. He received numerous awards and honors, including the Enrico Fermi Award in 1969. He was also the first president of the American Nuclear Society. Zinn died in Safety Harbor, Florida on February 14, 2000 at the age of 93. 1906 Dec 10th Born in Ontario, Canada. 1942 Dec 2nd Present at the world’s first self-sustaining nuclear chain reaction, Chicago Pile-1. 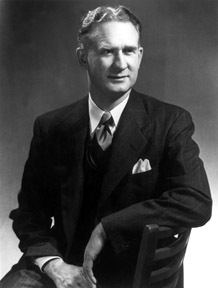 1946 to 1956 Served as Director of the Argonne National Laboratory. Walter Zinn. Photograph courtesy of Argonne National Laboratory.